Not to be outdone, on the east coast, the home of the Zulus and often called “The Last Outpost” due to its British influence, KwaZulu-Natal (previously called Natal) is a province of mountains, sea and bushveld. Forestry, sugar, paper, textiles and steel make the wheels go around in this well-populated province, home to at least 9 million people. 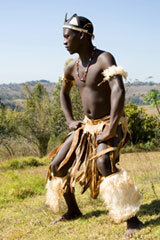 KwaZulu-Natal’s biophysical beauty is a draw card for tourists and local visitors which makes tourism her added bounty. Consider the tropical north and south coasts, the mountainous Drakensberg and rolling green hills of the Midlands. Consider the sugarcane lands further north and the wildness of the bush where wildlife meets marine life (at St Lucia and Kosi Bay for example). Durban is a bustling port and the capital of the province, Pietermaritzburg, hums with new development and good schools. Outdoor activities and farming make KZN an important contributor to South Africa’s GDP.